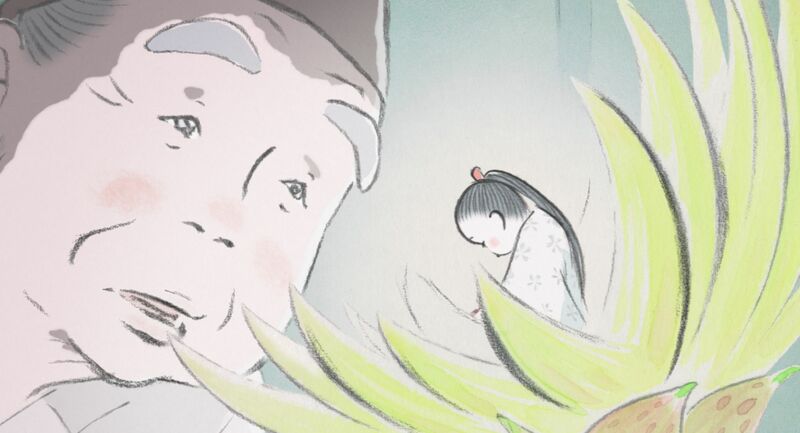 “The Tale of the Princess Kaguya” opens Friday at Sundance Cinemas. PG, 2:17, three and a half stars out of four. The animation in “The Tale of the Princess Kaguya” is created using cutting-edge 21st-century tools — pen, pencil, a splash from a watercolor brush. The latest offering from Japan’s treasure of an animation house, Studio Ghibli, emphasizes its hand-drawn marvels even more than “From Up on Poppy Hill” or “Spirited Away.” This really feels like a storybook come to life. The story it tells is both simple and sophisticated, with shadings of both childhood fantasy and psychological depth. Animator Isao Takahata, whose 1988 film “Grave of the Fireflies” is one of the pinnacles of animated cinema, knows that this is an expressive medium. When Princess Kaguya is cavorting through cherry blossoms, the colors are soft and warm, the lines delicate. When she charges off in a huff, the lines became jagged charcoal swipes, her form hardening and bending with rage. “Kaguya” is based on a 10th-century Japanese folktale, in which a bamboo cutter finds a tiny girl nestled inside a bamboo shoot. He takes the creature home to his wife, and when she picks up the girl, her maternal instincts trigger it to evolve into human newborn baby. The couple watch in awe as their adopted child grows in a matter of days, from newborn to infant, infant to toddler, toddler to small girl. “This is very strange, you know,” the bamboo cutter says, a master of understatement. But if you have children, the sensation of seeing your kids seemingly grow up right before your eyes is not strange at all. That’s the power of this story, that it’s fantastic and universal at the same time. Just as relatable is the plight of the teenage Princess Kaguya that the bamboo girl becomes. Tamed and cossetted by her parents, who have grown wealthy from the treasures that her magic has brought them, she is squirreled away from the world, told to passively wait for a suitor to claim her as his wife. How can this fiery, raw girl be turned into a demure wife, the sort who has her eyebrows plucked? We see her chafe against the social bonds of ancient Japanese society. When five suitors come slobbering all over her, comparing her to rare treasures — other objects to be admired — she sends them off to secure them for her. She’s clearly too good for them, but the dilemma becomes if she can ever find a place that suits her in such a restrictive culture for women. Eventually, Princess Kaguya’s true origins are revealed, and she must choose between her adoptive human world and where she came from. The story of “Kaguya” unfolds at a slow, meditative pace, and at well over two hours may tax even the most open-minded young viewer. But if you are able to slow down and sync up with the natural rhythms of Takahata’s storytelling, it is a wonder to behold. In a nifty move, the first show of the day at Sundance (at 1:20 p.m.) will be shown in a dubbed English version, with American actors like Chloe Grace-Moretz and James Caan providing the voices. Shows later in the day will featured the original Japanese version with English subtitles. 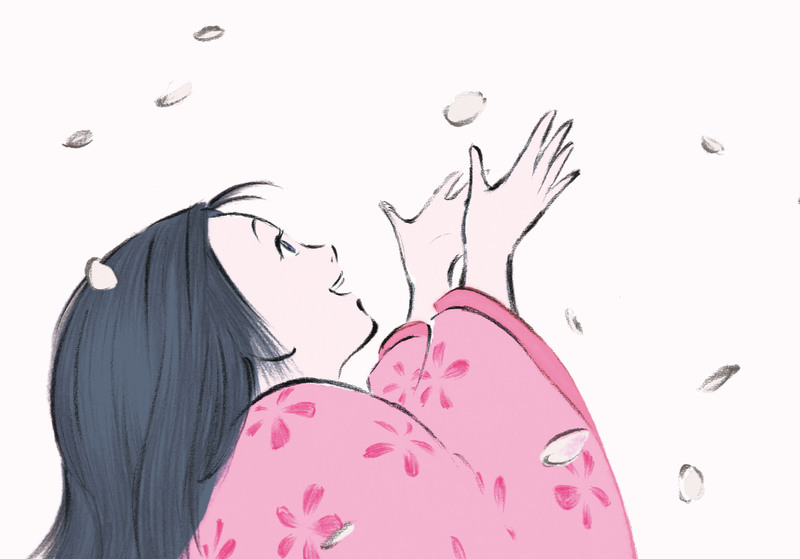 Either way, “Princess Kaguya” is a singular experience that is not to be missed.